There’s this song that I love called (translated): The Moon Represents My Heart or Yue Liang Dai Biao Wo De Xin (Hanyu pinyin). It was sung and popularised by the late Teresa Teng. Taken out of context, the moon is a moon, and is generally not considered anything special. However, in the Chinese culture the moon is much more than just “a moon”. The moon in the Chinese culture is something like the sun in the Western culture. Not the same in the literal sense, but rather, in terms of its importance and value, it’s really pretty close — e.g. Western culture uses the Sun to tell time, while the Chinese use the moon (without which there will be no Lunar New Year). And time, arguably, is of great importance to man. But putting these cultural differences aside, was there any significance as to why the moon was used in this way to represent the heart? I’ve been looking for resources on this over the internet, but commentary on this song in English (I don’t know about Chinese) has been non-existent. That’s why I have decided to give some commentary of my own. The very reason why I took an interest in finding out the meaning of this song was because firstly, the language used is simple — mostly words we use in everyday conversations — and therefore the lyrics are accessible for just about anyone versed in even a little bit of the Chinese language. Secondly, I was thinking about the fleeting feelings I had for the subjects of my romantic fancy. I’ve been infatuated with girls before, only for the infatuation to steal away for a while, and return with a vengeance. At that time I thought that I was perhaps just being childish and fickle for not holding on to that feeling (of love) forever. Then one day while thinking about the fickleness of love, this song came to mind: “the moon represents my heart.” Wait a minute… the moon?? “that’s a weird representation of a muscle,” I thought to myself. I went out to take a look at the moon, hmm… it was a moonless night! Sheesh, some love song. On a moonless night it would be a stupid song for a lover. Then it struck me. On a moonless night, one cannot see the moon, and yet one knows the moon is there — somewhere out there, but out there somewhere. Gosh, there was more to this metaphor than meets the eye. Suddenly it dawned on me why the moon was a great metaphor for love. Firstly, the moon brings to mind night, and all the associations that come with it. Some of these associations include romantic feelings from candle-light meals, feelings when one settles onto the same bed as one’s partner, or when one goes out together with a loved one for slow walks by the sea. With its connotations of night, the moon is inherently romantic. Then comes the moon as an indicator of love. The feeling of love does not last unwaveringly day in, day out. It comes and goes, and it’s when it goes that determines who the successful couples are. The moon changes all the time, from the full-moon, to the half-moon, to the crescent moon, followed by several moonless nights — then magically, the crescent moon comes back into being, and grows to the half-moon, and finally becomes full again! Like magic, love appears is replenished through time. And like magic, the moon appears to change through time. Bit does the moon really change over time? It’s always the same moon, it’s only how it is viewed that makes it seem different. From certain angles, the moon reflects light in a certain way, from other angles, it reflects light in other ways. And yet love, though seemingly different, never changes. Underneath the veil of a half-moon, or crescent moon or moonlessness, there is a full moon just waiting to appear. Add to all this the significance of the moon in Chinese culture, and you get a great song. According to a reader of mine, Angela, this song is sung on the moon festival…or autumn festival….and on that night the moon is the fullest in teh whole year [sic]. The festival mentioned here is the mid-autumn festival, or as many Chinese fondly call it, the moon-cake festival (for we all love them! and it is only during this time that they are wildly sold). If this is so, it would provide another (and possibly originally intended) explanation. Interpret it as you will: for the purposes of practicality, you might want to use the meaning I put forth on this page. But if you do somehow manage to recall this song during the festival, then you can use that meaning instead! To conclude, the moon metaphor is how I would represent my own feelings for someone. It isn’t that I love or don’t love you, because I do; it’s only that at some times my love is more obvious than at others. If you are looking for Teresa Teng’s CDs or DVDs, you can try looking for them on Amazon.com . Just be careful when you purchase them, as many of them are for her Japanese songs (she was fluent in Japanese and Chinese). If you’re still not satisfied with what you’re looking for, I might be able to source your her CDs in Singapore. Just drop me an e-mail at teresa.teng (at) edonn.com and we might be able to work something out. Happy shopping! Want to leave a comment on this song? Comment here! What on Earth is Ezed? I know this song from unmemorable times from my first trips to Asia when I was no more than a kid. But since I did not understand Mandarim I never knew what it meant. I moved to Asia and I am studying Mandarim now so I decided to understand the lyrics of this song. I totally agree with you about your interpretations of the meaning of the metaphor of the heart/moon. To chinese, the moon and autumm are female, according to a Dictionary of Chinese Symbols which has two pages for “Yùe”. The emperor is related to the sun as the empress is related to the moon. Thanks Che. Comments like yours are what keep this site (and me) going! This song The Moon Represent My Heart was a great love song, even thou my mp3 is just mandarin, but when i read the english translation, I know many relationship will be better, if they only understand the song. Even thou they do not understand the language. But if they listen to their hearts while plaing this song, its very nice. to a video of a girl playing this song. Really nice. – Spicy mamma. Find the chicken in the chili, and other fun foods. I love this song. I too never knew what it meant and listened to it from my Dad’s disc for years. It’s such a beautiful song. I really need to learn Mandarin. Wo ai ni you jifen. (I love you to the utmost). (The moon represents my heart). (Would already move my heart). (Makes me long for it till now). i was only searching for the pinyin lyrics of this song and i found ur blog w/ the english translation. thanks. sharing. there’s a filipino movie series that uses this song (almost) every year at the metro manila film festival. i love it more because jerry yan (F4) performed it during a concert here in manila. this song is great….even tho i dont understand it, find it on youtube.com. an anonymous chinese girl sings it even better.. I loved this song ever since I first heard it while traveling in China (I am from US), and it has caused me to be a huge Teresa Teng fan. I have searched and found many of her CDs on eBay and have collected the best on a couple CDs of my own. I wish I could find lyrics and title translations for all of my favorites. Her voice and the way she sings is the most beautiful I have ever heard. Even though I do not understand Chinese, the way she conveys the feeling in this song, I could get the feeling of what it was about. One other point about the moon that is relevant to the meaning of the song, in addition to the very fine explanation you have given, is the moon that I see is the same as the moon that someone else may see on the same night, even though they may be separated by a great distance. hi im cris from philippines! somebody introduce me this song and when i heard it i began to like this song even i dont understand it before.but now i learn this song and the meaning of it i feel different,coz this song really touches my heart! GOD BLESS TO EVERYONE…. I remember my mother singing this song when I was little, but I was never able to find it until now! Thank you so much for posting a link to the mp3s. I love this song. anyways i forgot to thank donn thank you very much for having it translate though i have a Chinese blood still i could not understand since i studied in a catholic school but thanks to you finally i have translation for mom thanks donn thanks very much you gave my mom a very rewarding fulfillment . thanks very much for donn’s great job! and it’s very surprise to me to knowing that so many foreigners are charmed by ms teresa teng! yeah! agreed with don, her voice is the most beautiful we have ever heard!! This is one of my favorite Chinese songs of all time. I’ve heard it sung by many female artists, but the late Leslie Cheung also sang it at concert once while announcing his love for his partner, Daffy Tong. I have his version of the mp3 downloaded, but you reminded me to get the original (Teresa Teng’s) too. The lyrics are so beautiful and poetic. Though the words are “simple” they contain so many interpretations and sentimentalities that make this song so interesting in the hearts of many. Like #10, I too was searching the internet for the lyrics to this song. I’m currently studying Mandarin and it’s one of the first songs, other than a few children songs I’ve learned and used to enhance my linguistic abilities. the song is sometimes scary when played late in the night. Btw, your interpretation of the song is good. But, my interpretation would be something like that the moon represents something that will always be there. Like even when you can’t see it, it’s still there. So, when Teresa Teng said that the moon represents my heart means, my heart will never change. So, it means something like, even though you don’t see it, my heart still loves you, that’s why she used the moon as a metaphor, i think. Thank you for the interpretation. I miss that special someone still…I’ll nver forget the love he had shared for me. Missing you Jianlin. Thank you so much for posting this translated version! I did my PSLE in Singapore and received Chinese Tuition classes, but have become hopeless losing it all living in Australia now. This is a classic song and now I can sing along to it, thanks to you. This is most useful and enlightening. Have been looking for the lyrics and meaning to this wonderful, ageless tune from TT. It will stay on in the memories of all who knew her, and who happened to be fortunate enough to around during her lifetime. I’m currently in Chinese 2 as a high school student. My teacher requested that we learn this song so I was looking around for some extra information on the translation of it. Though I’m not very fluent in this language yet, it’s a beautiful song! The translation is almost as beautiful in English, but in my opinion, songs are always their best in the original language. I also think your interpertations of the song are quite accurate. I thank you for the insight you’ve given me for this song, I appreciate it quite a bit! Thanks, this is a good song. I have just known it when my friend sing. She sing very well. That is reason take me to this forum. The lyric is so romantic, for example, “so soft was the kiss” and this sentences repeated many time “you ask how deeply i love you and just how great my love is”, what does it mean ? now let imagine you and your girlfriend or your boyfriend sit in a romantic place – with me, the most romantic place is in bus – and he or she turn toward you and ask this sentence or some kind like that. what happeing next, i dont know. Let enjoy your life. Lisen and dream about that. I have been learning chinese for a long while, and this song is not out of the range of my vocabulary. Upon studying chinese culture, I found that the moon is ‘yuan man’ or ‘bright and round’. The chinese culture really likes circular things, because it represents unity. Furthermore, the brightness, would emphasise the strength of love. So using the moon to represent your love is very effective in that it represents ths strength and ‘whole-hearted’ness of love. I first learned of this song and of Deng Li Jun (i.e., Teresa Teng) during a month long study abroad trip to China in May 2005. I overheard a Deng Li Jun song and mentioned to one of the Chinese students how much I enjoyed her voice. She and I went shopping and I found a great CD of Teresa Teng music, including (of course) Yue liang dai biao wo de xin. When I returned to the States, I showed the CD to my sweetheart (who happens to be Singaporean), and she was startled. Her mom absolutely adores Deng Li Jun, and my sweetie fondly remembers listening to Deng Li Jun during her childhood. At any rate, I am captivated by Deng Li Jun’s tender, vulnerable voice, and Yue liang dai biao wo de xin is one of her most beautiful songs. I tried e-mailing you but the address it kept on bouncing. Anyways, I do not have the piano sheet (nor do I know where to find it). I have, however, found the guitar tab sheet. I’m not quite musically inclined, so I’m not sure if it’d even be useful to you; but from past experience listening to my elder sis play the piano, even guitar tabs might help in deciphering the notes for the piano as well. I hope you find that it does. I love this song ( The moon represents my heart ) very much and really want to learn to play it on the piano. But coudnt find the sheet anywhere. Could you tell me please where do you or your sister get the music scores? thanks for the lyrics. this song was used in a filipino movie about the chinese here in the philippines. great song! I love this song, but do not understand Mandarin.Thank you so much for your translation! I don’t know why everyone insists on saying this song is called “The Moon Represents My Heart”, but it is tricky to translate in some respects. I would go with “Moonlight” instead of “Moon”, first of all. The moon is yueqiu, and while yueliang is sometimes translated as moon, liang means “light” and I think that’s what the writer was getting at (not that I’ve asked…). Also…”represents” is just a bad but hard to avoid translation of a really tough term to translate here. Daibiao. It does mean that “represent” in most cases, but in this case it is closer to “speaks for”, as an English version of the song used in its title. Even that isn’t really it, but it seems closer to me. Last, I think the line goes, “you ask me how deeply I love you / how many ways do I love you”…not “how much”. Hi croozn. Thanks for your comments, though I do have some thoughts myself on the matters you have addressed. Firstly, I believe that the translation of yueliang, though literally meaning “moonlight”, does not convey the same poetic potency that “moon” does. “Moonlight” sounds almost too scientific, while “moon” does a better job at conjuring up romantic notions. “Dai biao” can mean represent, or it could mean “speaks for” as you said. It’s really nitty-gritty stuff, and it might go either (or any) way. However, since this song is most popularly translated to have “represent”, I think I’d go with it. Regarding the line “you ask me… …do I love you”, The words “ji fen” mean literally, “score”, as in “how many points”. But when translated to English, uses the western world’s take on love, where “how much do you love me?” is more prevalent than “how many ways do you love me?”. In translating this song, I did my best to take into account the literal as well as figurative meanings, as I believe this song is like poetry, and an accurate word-for-word translation would do it no justice. eventhough i didn’t understand this song, somehow i feel so connected to this… what a wonderful song. I, too, have been learning Mandarin for the past two years. Even though I am Chinese, I’m just beginning to understand the ambiquity of the language which is part of its beauty. A Chinese poem could be read by ten people and each person will probably translate it differently. I’m suggesting to my class that we use this song as an easy entry song for learning Chinese. Even though many of us have trouble with the Pinyin tones, since the music is also scaled, intuitively we will be more likely to use the correct tone while trying to sing it. Also thank you such much for the guitar music sheet, I’m going to try it on my guitar and see how it sounds. Great website!! does anyone know the original composer for the song? Thanks! You know the Vietnamese version is a “cover” of a version of this song by David Tao. Uses the same beat though. This song is my favourite since 2001 even without knowing complete meaning. I was moved by this song when first time i was visited china and got an special feeling with my loveone. I like to thanks for such a wonderful site which provide the lyrics with english translation and make me so happy today. Thanks. i’m happy to hear this song but i can’t get it on baidu because i don’t understand chinese and don’t know which link click on! can u send me this song directly via email,please? if you have some time,of course! I appreciate your translation and detailed explanation of this most beautiful song Yueliang Daibiao Wo de Xin. Like some of othe other commenters I’m currently studying Mandarin Chinese and this was one of the first songs I was introduced to. I too was just scanning the internet to find lyrics for the songs because I’ve read other posts and commentaries and yours is the best thus far. You’ve done a good job because Google has you rated in the top 10 of their searches for this song and 4 years after the original posts you’re still getting commentaries. Many favorite comment that someone else quoted above is, “to truly learn a language, one must learn the culture.” This song with it’s “simple” words truly reflects this statement. P.S. Everyone has a right to their opinion but please don’t knock someone’s effort to give their interpretation. Donn isn’t claiming to be an authority so if we must criticize, please do it in such a way that you’re not attacking and tearing down. i love teresa teng.. i heard this when i was so young.. well probably more than ten years ago.. i learned what it meant finally! i’m trying hard to finish everything here in america and planning to move back to asia and study my native tongue which is mandarin.. ok, that’s it.. teresa teng still rocks! There is this video of teresa teng on youtube under “Three Classic Chinese Songs” and the first one is so beautiful. would u happen to know the name and where i can find the english and chinese lyrics? Tho I’m chinese, my friends know I can’t speak much chinese (I know.. it’s terrible..) So, for my wedding dinner this weekend, I want to surprise everyone by singing this song. My husband-to-be will be singing this in a duet with me. He thinks it sounds good and I’m practicing hard to get my pronunciation right. I was searching high and low for someone to provide me the explanation for this song… and how I’m blessed that my friend recommended your site. Thanks again!!! Fingers crossed.. This song was one of my mum’s favourite, and I’ve been listening to it since I was a very young child. In school, we would be taught to play this song on the recorder. Being English/Chinese educated, I think that this song is definitely a classic not to be missed even for the English educated. shie xie donn! thank you for translating it to english.. i really love this song, i first saw its video in the local chinese network about ten years ago.. and it feels so nice listening to it.. kim yap chiu (teen star in the philippines)also revived this song and still its sounds so good.. eventhough im chinese, im just starting to learn the language(mandarin and folkien).. im hoping that within this year, i will be able to pronounce the lyrics well.. (”,)hmmp.! it really,really so sad when you hear that song. When i heared it sang by Zsa Zsa Padilla here in Philippines while they’re having a taping in chine,Mano po 2. My grandma likes Chinese songs too because she can imagine our bloodline which i also have a chinesde blood. She played it when we celebrate our chinese new year…. Hi, I love that song “The moon represents my heart” especially played by Kenny G. It’s a great song, I think. The first time I listened to it was in a chinese restaurant. And by later I recognized the beautiful melody in the korean movie “Four sisters”. Great song, indeed! hi miss teresa teng,, i just want you to know that i love the message and tune of your song “yue liang dao biao wo de xin” even if im only 15 yrs old and cant really relate to this love songs and cant understand mandarin or pinyin, still i love this song…………thats all thank u!!!!!! ahmnn…this song is very meaningful..and so beautiful..even though i cant understand but i felt its so nice…thanks to ms.teresa…because she have the translation…thank you…its so nice!! P.S. Do you also have a commentary on other songs by Teresa Teng such as “Tian Mi Mi” or “Jin Tian Kan Ni Zhenme Shuo”?? I would love to read them as well! Thanks friend for posting such a gem. Teresa’s voice is like the angel’s. I really appreciate the songs had sung by this beautiful woman. Even though i can’t understand the lyrics but deep in my heart, the songs are really inspiring. I asked my co-teachers (chinese teachers) in our school about her and they gave me two thumbs-up! Aside from the featured song The Moon Represents my Heart, try also Tian Mi Mi. Teresa, you stay in my heart! I first heard the song in a Hong Kong movie. Last month, I bought Kenny G’s album “the most romantic melodies of all time”. I love the song so much. Now I’m listening to it over and over in youtube. The music is so beautiful and the meaning touches my heart. If you’re thinking of someone. This song can really represent your heart. I’m an italian student..I study chinese at university. One day our chinese teacher brought us one of Teresa CD’s…her songs are really beautiful but this…..is the most beautiful!!!absolutely! !and now I appriciate it more because of the english translation!Thank you! !and thanks also for the pinyin version!! I really love Teresa…..Teresa forever!!!!!!!! I was googling for info about Teresa Teng when I found this site. I’ve always known this song but never truly understand it meaning. Now I appreciate it more. to the creator of the song she’s soooo brilliant!!!!!!! Thanks so much for posting the English and Pinyin lyrics. I first heard this song in a Hong Kong movie starring Maggie Cheung. I have always liked this song even though I did not know what the lyrics meant. The melody and lyrics truly speaks for my heart. The song reminds me of what love really is and how much I love my boyfriend. Your interpretation of the lyrics helped me understand this song better. I look forward to singing this to my beloved in the future. I love this song very much. Thank you for posting those. However, the link to the guitar tab don’t work anymore. Could you send me by email? thank you very much. Thank you for sharing this. I love your explaination also, it is very logical. …wow…first i heard this song at my service..and then i ask myself is this a new song by kim?..and then i heard it again and i was so happy with it because if they did not sing this i will be out of love! !…i love it,it is very nice song..
tough i dont understand the meaning,until i read it here. i really like your site! more powers! Like most of us here, we love this song, we love this singer, but we don’t know lyrics well & we have no clue what the whole song mean. I grew up hearing Chinese songs around when my parents were happily married then I was separated from my father when they were divorced & I moved to the US. I no longer had interest in Chinese music whatsoever. I hadn’t talked or kept in touch w/ my father for 15 yrs after my last visit to Thailand. When I came back from his funeral (2006), I kept listening to Deng Li Jing’s CD’s for I felt closer to him. Not knowing their lyrics & meaning well enough to sing & understand, I turned my back to Chinese music afterwards. 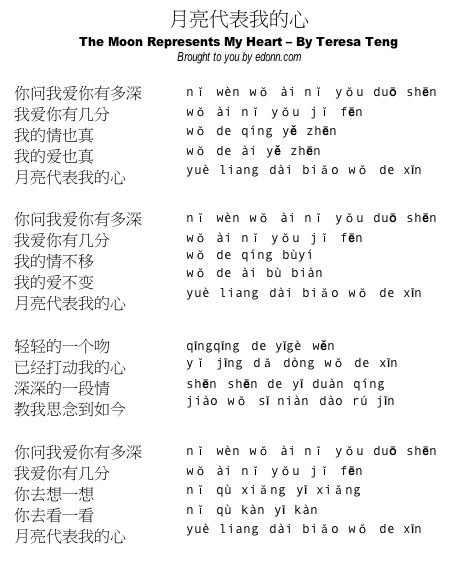 Now, a friend on internet e-mailed me this song “Yue Liang Dai Biao Wo De Xin” on Valentine’s Day. I’m determined this time to learn lyrics and meaning, especially this sweet one! Listen to her music, it brings back childhood memories & joy. I am glad that a lot of people feel the same way, and I really appreciate that I found your site. Thank you! Pingback: ARIA The Origination 10 at hontou ni sou omou? I start appreciating this music when Jerry Yan sung it with Teresa Teng! Great combination of voices.. very relaxing. I decided to run the idea by my sister, and she loves the song so much, she wants to sing it to her fiance at their rehearsal dinner. So, I’m in search of the sheet music that has the instrumental section and a vocal section; and an instrumental/karaoke track. Can anyone help me? I’ve called the local karaoke stores and have been searching the internet – no luck so far often because I can’t read the Chinese websites. Any help would be greatly appreciated! The wedding is a month away! thanks for the lyrics….i heard this song from jerry yan during HK concert with F4. Thank you for this article! This is the first Chinese song I’m learning, but I hope to learn more. I’m living in Shanghai, so I guess I should start practicing! i love this song.. i first heard it in a taiwanese drama.. was it love contract?.. i can’t remember..
i really really hope to see teresa teng on the past and tell him to take a rest and not to go to her concert to thailand(i think) since she has an attack of asthma… if she is still living now i am very sure she will be a big all time hit singer… but GOd has a reason why this happens to her… by the way i only 16 and i think if i grew up i have a plan to go to her place in cementery…. teresa teng if you are reading this i hing i can only say to you the moon represents my heart to you as a fan of yours…. Hi Donn… I play this song on my guitar… quite ez.. Ooooh!!! I love this song. Both melody and lyric are beautiful. Has anyone have this song sung by Karylle?? Can you share it with me?? Send to:braino29@yahoo.com if you please ^^. thank you so much!!! As far as I can tell, what you have “may the moon represent my heart” is not quite that accurate. The song is more a statement of “look, the moon represents the heart” as opposed to “may the moon represent my heart” which sounds almost hopeful. I suppose your definition may hold in the “scientific” sense, but in the “artistic” sense, the subjunctive doesn’t quite make it for this song. The lyric could be paraphrased as ‘Well if you have doubt about my love for you, then go and look at the moon and may the moon represent my heart’. The moon is taken an object on which you swear your feelings on, rather like the Bible in the law courts of the West, which represent telling the truth and if you don’t then you are damned. The moon is true and the Bible is true, and for ‘is’ read ‘be’. It is rather unfortunate that many written work in the Chinese language have only been translated partially correctly which cause even more chaos in the secondary literature, as different people try to impose their interpretation on the original work not realising that the translation was itself wrong. Interpretations are as many the number of people out there Chan. And the funny thing is, I don’t see how much my translation really differs from yours. I’m reading it, and finding that the idea behind it is essentially the same! The paraphrased lyric that you quoted was different from mine by just two words: “and may”. I find that this song is much like poetry, where each reader gets a little bit of a different meaning, depending on where he or she is in his or her life. I hope that you can trust that my interpretation of this song really isn’t just a babel-fish translation, I’m a native speaker of mandarin myself (living in Singapore my whole life, with a mandarin-speaking girlfriend, and working in an almost mandarin-only workplace. BUT, all said and done, I do see where you’re coming from, and I do appreciate your comments (though I would have appreciated it more if you had thanked me for the hard work in translating it!) Your interpretation isn’t wrong, but I don’t really buy it. Sigh, it’s unfortunate how much work we translators put in to help pass the beauty of songs to the masses and become so unappreciated in the end, causing chaos in our hearts and minds, not realising that interpretations are never really right or wrong, but only that thinking makes it so. Okay, I’m feeling a little mean now, so I think I had better stop. But like any other human being, I’m just being defensive as my work has just been attacked! I’ll get over it soon, and we’ll see how it goes from there Chan! Hey Donne, thanks for translating it. I do not doubt you are a native Mandarin speaker, but I am talking about English and an ‘s’ can make all the difference to the meaning. i just wanna say that i really love this song so much it was given by my korean friend and i listened to it and start to like the song until its been my vitamin that every morning i should play it before going to work… and after a year i have met a chinese businessman whom the song is the one we have in common… he sings it and he was so suprised that i was able to accompany him and he was so happy to hear that it is my favorite song too. love this song it has a love magic on it! this song is trully special for me..
my ex sang this song for me, as he luved me..
n frankly, i still luv him damn much..
i wish he’s always happy in the heaven..
c ya sumday my dear josh..
actually, i really like this song when i first heard this song for the first time in the movie. eventhough i do not understand what its really mean but i love the melody. i tried hard to find this song because i’m cannot read and speak mandarin. so, its a little bit tough and upset to get this beautifol song. i do really love this song eventhough i’m in new generation. Thanks for your interpretation of this wonderful song. Now I know what it means. I missed the beauty of her voice. I listen to her a lot jogging and driving. She would always be in my heart. I really missed Teresa Teng! This is one of her signature song but I really love every song she sing. Check out this version though by Ms. Yuquan Chen, she kind of unknown but in my opinion she is much better than any of the known professional singer. Thank you very much for your English translation and romanised Chinese as well as the Chinese characters of this evergreen song. I truly appreciate what you have done. Would you have the time to do the same for other Terese Teng’s songs? Thank you Donn. It is my pleasure to let you know how much I appreciated what you have done. Great work. Such a great song if only it was performed more often. Hello, can you send me the guitar tab for guitar solo for this lovely song by Teresa Teng? Appreciate your help. Thank you very much. I’m almost done with my new CD, which includes a bossa nova version of this song. You can listen to the version, which is sung by Shanghainese vocalist Zhang Le, on http://www.myspace.com/shanghaiblue. Following the suggestions from this website, I entitled it “The Moon Speaks For My Heart” (instead of “The Moon Represents My Heart”). what i can only say is that this song made me so obsessed with Mandarin, and now I am learning gradually..this song also made a big teresa teng fan..and now, just reading your interpretation of the song, i think i fell even more in love with it..this is the most moving song i have ever heard…thank you for your lovely yet analytical explanation of the song..
mmm… this is teresa tengs most famous song… youll hear it in every taiwanese and hong kong tv drama, and ppl in korea, japan, taiwan, australia, hong kong, indonesia, malaysia and EVEN mainland china know it, even tho teresa teng music was banned in mainland china because shes taiwanese. Is there a easy way for me to print out a piano sheet for “The Moon Represent My Heart”? Can I get a specific link to it so it’ll be easier. Donn…….That is awesome, what you did with “The Moon Represents My Heart”, translating it to English and the pinyin wordings. That is so helpful to overseas Chinese like myself who are unfortunately Chinese language-challenged. When you have the time, if you could do the same for another Teresa song called “Love in the Snow”, which is “Xue Zhong Qing”, that would be beyond awesome. Kung Hei Fat Choy to you, my brother. Donn…..I was just scrolling down your page of comments here and saw what J. Chan and croozn had to say about your translation. I just have to say that J Chan doesn’t make any sense at all with his mention of the subjunctive. How does he justify using “represent” which makes it a plural form of the verb while the subject, “the moon” is singular? And croozn’s suggestion of moonlight entirely misses the mark! A literal translation of moonlight would destroy the spirit of the song since moonlight is fleeting and the moon is constant….which is the whole idea the song conveys. I would be the first to tell you the word “represents” in a song title is a little jarring to the senses because its sound is neither poetic or lyrical, but under the circumstances, I find it hard to come up with an alternative to it, so I can gladly live with that. To discuss the translation and ignore the song would be like pointing a finger at the moon and looking at the finger, and so you miss all that heavenly glory, as Bruce Lee said in Enter the Dragon. But a little discussion is good if it will help us to understand anything better, so many thanks to our brothers J Chan and croozn for their honest input. In this song, you are asked to look at what the moon is like. the moon is also looked beautiful, pleasant, gentle and lovely … something to be appreciated, and keep looking at of course. So is the heart it represents. Ancient Chinese likes moon and wrote many poems and stories about it. And lovers think of each other whenever they see the moon, the only thing they can see in common everywhere, even when thousands of miles apart. Cheers, to all lovers, and lovers of the moon. This song has facinated me for a long time. I think the beauty lies in its honest simplicity. I’ve been chatting with several Students in China for about 2 years and that’s how I stumbled across it for the first time. I think I have it in about 30 different renditions. One thing that really bothered me was that nobody seems to have made an attempt to come up with a singable version in any language except Chinese. Well, I tried ! For those that just want to sing along and not want to deal with Chinese here is a version that’s as close as I could come up with. How lasting will it be? The moon will help you see. Hi Jeff, nice translation but I find your comments mildly offensive. Don’t want to “deal with” Chinese? It’s a Chinese song. Chinese is something you learn, not “deal with”. Hello thanks for giving a lyric tranlation english and chinese i like this song since 1995 , but i dont the know tiltle coz im not realy good in chinese. coz im Filipina i always hear sounds the chinese people in the philippines come from singapore, God bless you ….. thanks for the management of this sites she is wondeful song……. Thank you for this web-page! I ran across this song by accident on You Tube, and shared it with my fiancee in Hong Kong. She informed me it was her favorite song, and Teresa Teng her favorite artist. It meant a lot to me to have some sense of the meaning of the words in English. Thank you so very much! This song will now become officially “our song”. im so inlove with this song… feel like cryin everytime i hear it.. btw, is there a dance / pop version? Just googling for this song lyrics and accidentally found your page. The melody and Teresa’s voice of this song is kind of nostalgic for me, I heard this songs 30 more years ago. Thanks for a very good English translation (including inspiration of true meaning) and Hanyu Pin Yin image. Very nice work. The link for the pictures for the lyrics in simplified Chinese is not working. It’s missing a ‘h’ at the very beginning. I added the ‘h’ and downloaded the file. Thanks very much, it’s helping me improve my Chinese. I feel in love with a young lady in China. She told me this was her favarite song. I just want to say Thank you for your translation of the song. thank you for sharing. i love david tao’s cover of this song. I fell in love this song when my nan pengyou introduced it to me. I am currently studying Mandarin with the Confucius Institute and your entry made me fall in love with the song and language even more. Could anyone tell me where could I get the music sheets from this lovely song? I love it so much and want to play it on the piano. I first heard this song in the 80’s but like other English educated Hua Qiao, have no idea what it meant even though it had a lovely melody. You also taken the trouble to provide some context to your translation which makes it so much more meaningful to those who are not literate in Mandarin. So now I can even sing along and understand exactly what was meant by each line! Thank you Donn for providing excellent tranlation of the lyrics to English and providing the Pinyin version. mushi i hope you’ll forgive me. . .
you’re now happy of your life. . .
You all cannot imagine how honoured I am to have helped in your enjoyment of this song. Thank you all for your wonderful comments, it makes my day, everyday. i only want to learn the song on the piano !!!!! hahaha.. I know this song for a very long time but I never understand the meaning until i know youtube. I am a Chinese though, but never been to a Chinese school..lol. How I wish I can work in China.. for a short time..
look at the moon n you will find me…..(((((00))))) so sweet…!!! thanks for providing us the lyrics of the song..now i am very willing to learn more about mandarin although im a filipino..hehehe..salamat.. I first heard this song in Taiwan when I was kid. I haven’t figured out the translation until a few years ago, and it made me love the song more. It’s so pretty, and YES I heard it played during the Moon Festival – in fact it was where I discovered it! I really searched for this song.. I love this song..
gracias totales, teresa teng,que Dios en su sagrados brasos,te acurreque y te tenga en lo mejor de ese universo angelical,que tu voz ahoa cante con el resto de las voces angelicales,gracias amiga se que ya no estas ,pero se que al decir tu nombre me escucharas,gracias totales.manuel from costa rica central america.port limon. Very interesting. I know this tune from Ireland but the words are different for Chinese. I like the metaphor of the moon. Pingback: [INFJ] Dump your love letters here!!! When we sing in mandarin, the character “de”(的) should be pronounced like “D” (“di” in pinyin) . Well, not all the time. When that character is singed softly, it is “de”,such as here “yi jin da dong wo de xin”. That’s a convention. Donn, first off, I want to congratulate you on your fine translation. I am actually not good at Mandarin, but may I suggest my own more liberal and less literal interpretation of the song. Of course 多多教育 if I have got this appeal for correction right as I am not Mandarin educated. Slight corrections, to better reflect the nuances involved? saya suka lagu ni sangat. The Moon Reflects My Heart? The English language isn’t best for poetry. Perhaps it is because of it grammar or format. Not to say that your translation is bad, I don’t get the same affection reading it’s English version of the song, and I am fluent in English. Hi Donn, Appreciate the english translation, so that I understand what I’m learning to sing. The explanation of the content and context in the culture is great! Comment like ” to really understand the language, one need to understand the culture” brings a whole new perspective and understanding when seen from the Chinese viewpoint. A lot of english ed. take it literally and regard such symbol as paganistic. Hi, may I know if you have the compilation cd – 月亮代表我的心 經典轉? It’s a 3-in-1 cd collection. Looking forward to your reply. Thanks. i love this post. Thank you for writing it with such enthusiasm. This song is going to be sung in my inter cultural play Our Man in Beijing showing at the famous indie company La Mama theatre in Melb, Aust. I was just browsing for the lyrics for this song for our female lead and stumble upon your website. What a lucky find. Then i noticed it was set up in 2003. If you read this Donn Lee, please get in touch with me. I am the artistic director of the Australasian Chinese Theatre in Aust and really would love to talk to you. Your post is simply awesome showing passion, attention to detail and above all, your depth of feeling. I am wondering what you end up doing as a career. I’m a singer who just arrived in China and of couse, I have to learn a Chinese song. The people I’m working with pointed that song- I loved the melody ever since I’ve heared it. I was hoping to find what’s the meaning of the lyrics and CHARAAAM- I crushed on your analysis! GREAT and helpful for a foreigner who’s willing to get closer to the Chinese soul! Pingback: Teacher’s Day | Pilipinas atbp. Thanks for your beautiful translation. I’m sharing this with my friends! Hope that’s ok since it’s only among my peers. I love this song- I found out about it and Teresa on TV. She has such a magical voice. ❤ Thanks again! SAYA TAU LAGU INI DARI GURU SAYA. Hi Donn, I have read some of the comments and it is quite amazing how your efforts here and the song and the great Teresa Tang have touch the hearts of so many, including mine. I have been a big fan of Teresa Tang and this song for many years and reading your translation has made me tear up. I have been married to a loving and loyal wife for 14 years and I have not always shown the love she deserves. I have felt very guilty for this. This song will remind me to show her more love. BTW, my 1 year old daughter loves this song as well. Kim Chiu’s version (on youtube) is what I mostly play for her. I’m amazed by your efforts to interpretate this song. To tell you the truth I’m not her (Teresa Teng) huge fan, but since my mom, and my dad her huge fan, I can’t help to being her huge fan too. This song sounds sad, yet romantic. Even my mom, and my dad dance together when they play this song, I’m really envy them!!! Thanks for Teresa Teng for her lovely song, and for Mr. Donn for your efforts to enlight me. Teresa Teng’s songs are very popular in Indonesia. Teresa Teng was also singing a few songs in Indonesian. I know this song (Yue Liang Dai Biao Wo De Xin) while still a child in the late 1970s and to this day the song still occupies the position as the number one mandarin song of the most famous in Indonesia. You Sir, you are awesome. Been searching for very long time. Wanted this song but difficult keywords; clicked “wo ai ni”, others came up. Until yesterday I heard the song sung near my ear: “ni wen wo ai ni….”, I wrote it. And TARAAA, I found you! I mean your article! Awesome! (actually my heart went so warm to find this). I really really thank you for providing this title, lyrics, hanyu-pinyin, and translation plus interpretation. YOU DID THIS BEAUTIFULLY, SO WELL! By the way, the moon is so special. Lunar new year that came from the moon is made sense. Moon-cake (yumm i love it); Chang’er and Hou Yi. Have you any IDEA about the moon: writing, poem, video, scientific review of the moon? Actually the moon has 10 unbelieveable facts? @Dominic, congrats on finding this song! Thank you for helping me understand this song. It was shared by a friend in Taiwan and I could see she felt it deeply. Thank you so much for sharing this with a “laowai” like me. I am touched by the lyrics and the explanation of the moon’s representation in this song. Listening to this song will surely help me to understand the pronunciation of the words because I’m going to study Mandarin soon. Understanding more of the Chinese culture and “guanxi” will certainly be beneficial for my future. this beautiful song is the song that I often sing to my lovely Chinese wife. So to me the words and meaning are of great feeling for us. So sad that Theresa died so young, such a lovely Singer and great girl. Graham. since you such enjoy Yue Liang Dai Biao Wo De Xin, please have a listen to what might be the first recording of an English translation. Naturally I had a burning curiosity to know the lyrics and the meaning. You’re in depth post totally satisfied that curiosity! Madd props sir! Love it. Love this song. Well it remind me of my first Mandari teacher. He love theresa teng’s song so much, and he ever tell us what is the menaing of this song. He said that in chinese, moon is a symbol of sadness. Hello Donn, thank you for your work. I have written a singable version of the song in German, based on your explanations. Thank you so much for your translations and lyrics. Because of this song,I want to learn Chinese. From Myanmar with love.